We raise funds for the Grandmothers to Grandmothers Campaign (G2G) through the sale of Fair Trade products and we enthusiastically and energetically support Fair Trade in our practices. A win-win! One of our members, Wilma, brings in Fair Trade coffee for us to buy at our monthly meetings. She is also a regular presence at our market events to sell to the general public. Wilma donates profits to the Grandmothers' Campaign. This past year she was able to donate $400 total. 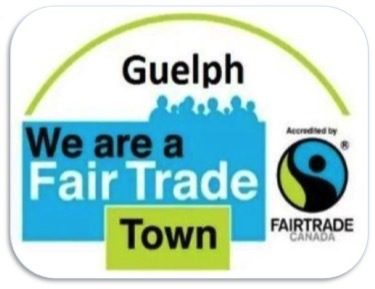 When a local Guelph committee was trying to get the city of Guelph designated as a a Fair Trade community, our group was approached as a leader in the communty and asked to add our support. We were happy you do so after their presentation and a Q & A and we sent a letter of support to City Council, including a commitment to put Fair Trade into practice. We recognized that although many 4G members individually buy Fair Trade, we wanted to do more. We passed a motion that confirmed our commitment to serve Fair Trade products at our monthly meetings and at all our events. We would each be conscious of promoting FairTrade in the many other activities in our lives. In addition, in the same spirit of Fair Trade, we engage in other best practices to tread as lightly as possible on our planet and at the same time raise funds for the Grandmothers to Grandmothers Campaign. One of our members sews and sells her lug-a-mug bags, not only to us, but in many venues ranging from shops to Third Age Learning events.